This Spring discover the thrill of one of my favorite travel experiences, sailing on board one of Star Clippers’ three tall ships: the four masted Star Clipper, its twin ship Star Flyer or Royal Clipper, the tallest full sail ship in the world. Beginning in April, Star Clippers’ full fleet will sail the hidden harbors, secluded beaches and secret hideaways of the Mediterranean. Spring sailings range from four-night escapes to 12-night Grand Mediterranean voyages, providing an in-depth exploration of the easter and western Mediterranean - without the crowds and the summer heat. Seven departures are scheduled between April and May and cover the very best ports across the French and Italian rivieras and into the Greek Isles. Each new season cruise offerings are enhanced by changing itineraries and adding new ports of call. This year, two new calls include: Sansury-sur Mer, France and Lerici, Italy - both picturesque seaside villages with specitacular views. I have my eye on Royal Clipper’s May 15th seven-night Sicily and Amalfi round-trip cruises from Rome, Italy. This itinerary focuses on some of the Mediterranean’s most charming and history-rich islands and towns including Ponza, Sorrento, Capri and Amalfi, Italy; Taormina, Sicily and Lipari and Stromboli. But, there’s plenty more to tempt. 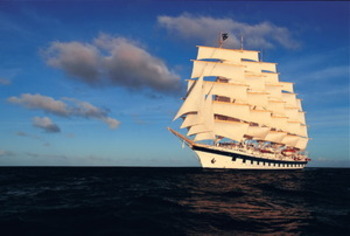 View the full selection of sailing itineraries, dates and rates at www.starclippers.com or call 1-800-442-0551. Star Clippers operates three of the world’s largest and tallest sailing vessels. Visiting ports often untouched by larger cruise ships and offering passengers the activities, amenities and atmosphere of a private yacht, Star Clippers is recognised as one of the premier speciality cruise lines. Passengers can enjoy the romance of sailing on board a true tall ship in a relaxed atmosphere with high standards of service provided by an attentive crew. All three ships have expansive teak decks, swimming pools, informal dining, a convivial Tropical Bar on deck and a comfortable piano bar and are large enough to offer first class accommodation and dining, but small enough to call into intimate ports, untouched by large cruise ships. The two smaller ships, Star Flyer and Star Clipper, take 170 passengers each, with a crew of 70, while Royal Clipper carries 227 with a crew of 106.